A little note to the typewriter, typed by my Mum in about 1989. 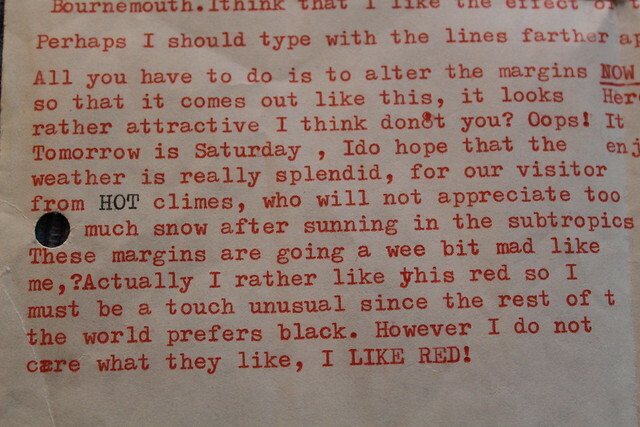 She had brought herself a typewriter and was just trying it out, as you do! I was on my way back from Tenerife. I kept the note. Red was her colour. She was the one who brought me my little red suitcase, also my red boots, my red coat, my red trousers.....I wore a lot of red. Which is funny really because deep down I'm probably a bluey green person more so, but red made her happy and now life wouldn't feel right without a burst of red here and there. When I think of the colour red I think of my Mum. There is nothing nicer than reflecting on times gone by. How sweet!!!!!!!! Whats not to like??!!!!!! Its the color of love!!!!!!!!! Have a super weekend!!!!!!!!! Your mum sounds like a really interesting lady. Thanks for sharing. red is my favourite colour, too!!!!! ….such a beautiful dear memory….